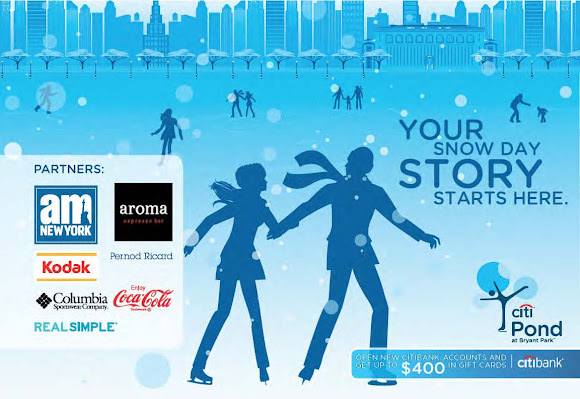 To make it even easier to enjoy Bryant Park this early winter, Citi (generous sponsor of Citi Pond for seven years running) has created the Citi Storybook, a free six-page brochure packed with information and special deals. Those deals include an opportunity to buy tickets to the Broadway comedy Stick Fly at 30% off, and discounts at Celsius, ’wichcraft, Lily O’Brien’s Chocolate Cafe, and Papyrus when using a Citi credit card or Citi Debit MasterCard. You’ll also find a schedule of four Music Nights at Citi Pond. The series, which includes DJs and one live performance and features a different musical genre each night, kicks off on Friday, January 27, with 80’s Music Night. The remaining dates are Wednesday, February 1 with R&B/Soul/Hip Hop Night; Friday, February 10, with a live Jazz performance produced by Jazz at Lincoln Center; and Friday, February 17, with Classic Rock Night. All music nights are from 7:00-9:00pm. You also get $4 off skate rental during that time. The Citi Storybook includes incentives to open an account at Citi. You can pick one up at Bryant Park, or at any Citi branch in New York. Thank you for sharing, this shouldn't have left unnoticed. I'm a Citibank client for several years and this is very useful to me.